I don't know why I keep getting surprised at how much I enjoy Scarlett Cole's books, especially when they're about one of my favorite romance tropes: rock stars. I read Jordan Reclaimed, the first book in the Preload series in the beginning of the year and went all Wow, this is a pleasant surprise, and yet again felt the same way about Elliott Redeemed, which, yeah, totally makes me look silly. Scarlett Cole has proven time and time again that she can write great, hot and angsty romance. She did it with her romantic suspense series, and, in my humble opinion, she's doing it even better now with the Preload series. I'm still so very much in love with all the band members, and dying to get my hands on the next titles. I'm guessing Lennon's story will reduce me to ashes, so I'm here...not-so-patiently waiting for that. 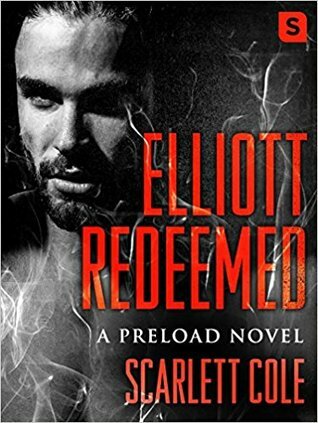 Elliott Redeemed (this title is impossible to spell right with all the double laters. LOL) is the story of band's guitarist, and just like the rest of his friends, he has some serious issues due to a troubled childhood. Issues that follow him to this day. Elliott is a diagnosed pyromaniac, but he's been keeping his urge to set things on fire under certain level control. This control is threatened when Elliott visits a kids' hospital and meets Daniel, a teen who burned himself badly after setting fire to his parents' house. Elliott also meets Daniel's mom, Kendalee, and that's when the romance kicks in. One thing I wished had been better explored about Kendalee was her relationship with religion. I liked seeing a religious woman as the main character, but I thought the story could've explored that element better. I didn't feel like there was a conclusion to that arc. I also wished Kendalee had been divorced already. I didn't feel like that plot involving her ex-husband added to the story in a positive way. Their romance didn't need another obstacle with everything that was already going on--Kendalee's doubt about how she fit in Elliott's life and how he fit in hers, her situation with Daniel and everything that had happened to him, and Elliott's secret and how it influenced Daniel's life. So the whole divorce thing was unecesssary, and almost left a bad taste in my mouth because she was still legally married when she started getting involved with Elliott. Those two elements aside, I truly enjoyed how Kendalee and Elliott found each other and developed a beautiful relationship. I loved Elliott for putting himself out there to help Daniel, even though it was hard and brought back bad memories. I also loved the few scenes we got with the rest of the band members and their loved ones interacting. As I said before, I'm anxious to see what Scarlett Cole writes next for these rock stars, and I'll try not to be surprised at how much I'll probably like that one, too.